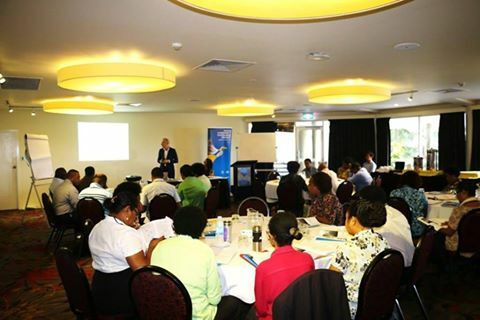 36 Papua New Guinean public servants have completed an intensive ethics short course delivered through the Pacific Leadership and Governance Precinct. The three-day course provided the participants with frameworks for ethical decision making in leadership. 20 women and 16 men travelled from across Papua New Guinea to attend, including participants from East Sepik, Eastern Highlands, Madang, Milne Bay, New Ireland, Port Moresby and Oro. Participants, who comprised current and emerging public sector leaders, were welcomed to the course by Ms Taies Sansan, Deputy Secretary of the Department of Resource Management, and Ms Jodie McAlister, Australian High Commission Counsellor for Economic Governance. “You are all from different places and organisations, but as public servants we have the shared goal of making a difference for our country and the communities that we live and work in,” Ms Sansan told the participants. “By understanding the importance of ethics to decision making, you will be able to further strengthen your own leadership to bring out the best in your colleagues and organisations. The course, a key component of the Precinct Leadership Program, is closely aligned with the Ethics and Values-Based Executive Leadership and Management Capability Framework and the Gender and Social Inclusion Policy; key policies of the Government of Papua New Guinea. The University of Queensland and the Ethics Centre facilitated the course as part of the Pacific Leadership and Governance Precinct, a joint initiative between the Governments of Papua New Guinea and Australia to forge a new generation of ethical and capable public sector leaders.